Star Trek fans will be disappointed to hear that Kate Mulgrew's voice puts Earth at the center of the universe. "I understand there has been some controversy about my participation in a documentary called THE PRINCIPLE. Let me assure everyone that I completely agree with the eminent physicist Lawrence Krauss, who was himself misrepresented in the film, and who has written a succinct rebuttal in SLATE. I am not a geocentrist, nor am I in any way a proponent of geocentrism. More importantly, I do not subscribe to anything Robert Sungenis has written regarding science and history and, had I known of his involvement, would most certainly have avoided this documentary. I was a voice for hire, and a misinformed one, at that. I apologize for any confusion that my voice on this trailer may have caused. Kate Mulgrew"
As Mulgrew said, Krauss's rebuttal can be found on Slate. Original Story: While the Star Trek franchise plays a little loose with time travel, warp fields, and other technobabble concepts, you can't deny that its creators loved science. Sure, each series bent the laws of physics more often than the Prime Directive, but they still embraced certain principles that scientists agree upon, like how the Earth revolves around the sun. Sadly, many are now wondering whether Star Trek: Voyager's Kate "Capt. 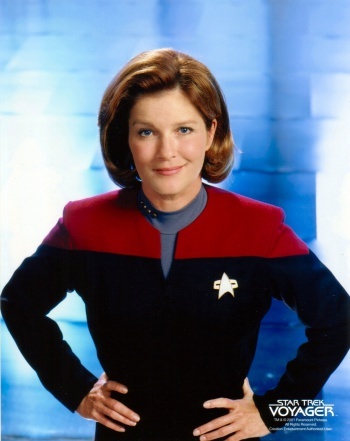 Janeway" Mulgrew forgot that minor detail. Despite spending five years playing a starship captain, Mulgrew will narrate The Principle, a 2014 documentary endorsing the defunct theory that the sun revolves around the Earth. "Everyone knows that the ancient idea of Earth in the center of the universe is a ridiculous holdover from a superstitious age, right?" reads The Principle's trailer description. "Modern science has proven that we are nothing special ... prepare to be shocked! The Principle, destined to become one of the most controversial films of our time, brings before the public eye astonishing results from recent large-scale surveys of our universe - surveys which disclose unexpected evidence of a preferred direction in the cosmos, aligned with our supposedly insignificant Earth." In The Principle's trailer, scientists are shown describing how Earth's unique features make it well-suited for life to evolve. Suddenly, a geocentric-sounding quote is inserted by The Principle's producer Robert Sungenis. "You can go on some websites of NASA," Sungenis says, "to see that they've started to take down stuff that might hint to a geocentric universe." Sungenis is a geocentrism advocate and author of Galileo Was Wrong: The Church Was Right who once found himself mired in controversy for denying evidence of the Holocaust. Those featured scientists meanwhile, including Michio Kaku, Lawrence Krauss, and Max Tegmart, may have had nothing to do with The Principle at all. "For all who asked: Some clips of me apparently were mined for movie on geocentricism," Krauss wrote on Twitter. "So stupid does disservice to word nonsense. Ignore it." It's worth remembering at this point that Mulgrew is an actress and not a scientist. I doubt she's had any part in compiling The Principle's "scientific knowledge", and was likely only hired to read from a script. It's even possible that Mulgrew doesn't endorse The Principle's message, but it's hard to imagine why she'd be involved if not. After all, Mulgrew isn't short on work right now, having returned to the public eye as Red in Orange is the New Black. The Principle is slated to release later this spring.